Some say that Lanikai Beach is the beach on Oahu. In fact, Lanikai Beach constantly pops on different lists of the top beaches in Hawaii – and in the entire world. So what makes Lanikai Beach so special? Local residents on Oahu enjoy Lanikai Beach alongside tourists, which, to me, is the mark of something special in a tourist destination like Hawaii. When there is something so good that locals spend their weekends there, you know it’s more than a tourist trap. Speaking as someone who lives here, I love spending the day at Lanikai Beach. The sand is powdery, the water is crystal clear, and the Mokulua Islands in the distance make for a stunning backdrop. You might even see a sea turtle swimming in the water. 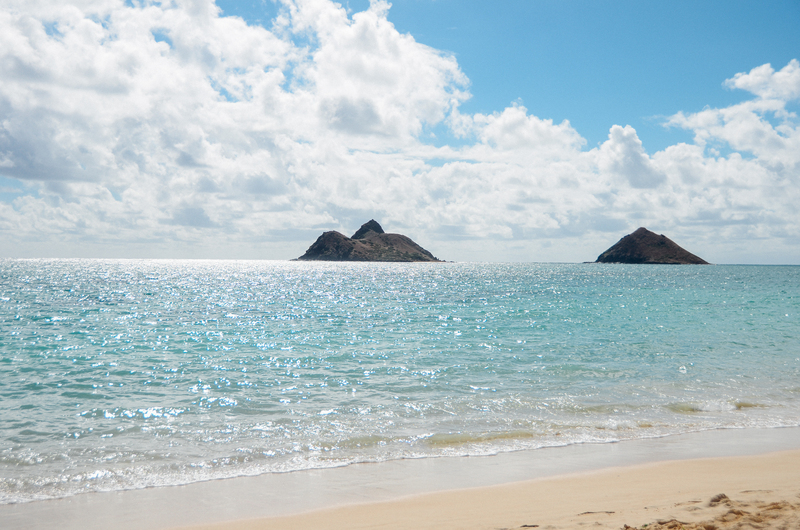 Plus, Lanikai Beach is home to and close to some of the best activities on the entire island. But one thing that I’ve learned from beach-hopping all over the island is that Lanikai Beach is very different from other beaches on Oahu, or other beaches that you might be used to. 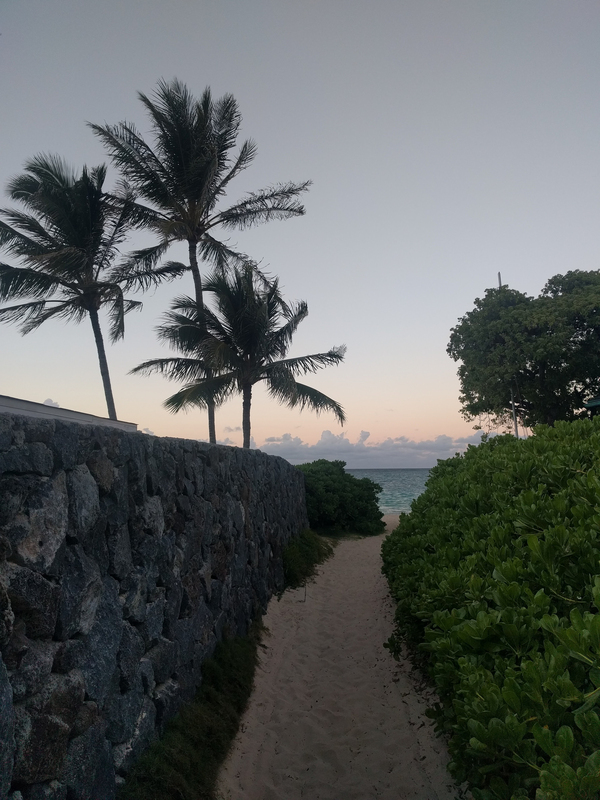 Today, I thought I would give you the low-down on Lanikai Beach – the good and the bad – so that you can decide for yourself if a trip to Lanikai Beach is right for you during your vacation on Oahu. Here at Hawaii Aloha Travel, use our local knowledge to make sure what your trip meets your needs and expectations. Lanikai Beach in the evening. You don't get to see the sunset, but the sky changing colors behind the Mokulua Islands is an incredible sight. I personally love taking people to Lanikai Beach because there is just so much to do there. That makes the extra effort to get there worth it. 1. Lanikai Beach is my absolute favorite place to watch the sunrise on Oahu. Click here for a list of other places on Oahu to watch the sunrise. 2. 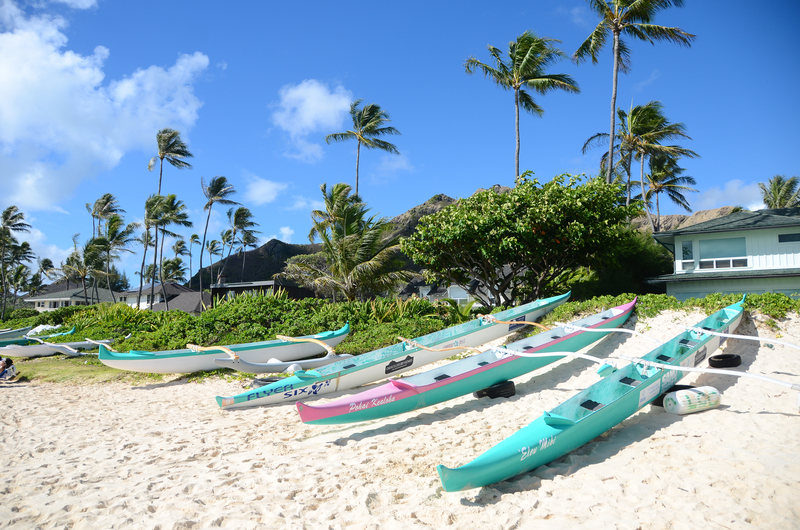 You can rent kayaks in Kailua and kayak out to Lanikai Beach. If you’re feeling adventurous, you can take them all the way to Moku Nui (the island on the left). Read more about that adventure here. The view of the Mokulua Islands from Lanikai Beach. You can kayak to Moku Nui, the island on the left. 3. My favorite hike in Hawaii, The Pillbox Trail, is in Lanikai. There is nothing better than going on a hot hike and then jumping into the water after! Bring beach chairs, an umbrella for shade, sunscreen, a book if you like to read on the beach, towels, and a cooler with plenty of food and water. There isn’t anywhere to get snacks or water within walking distance, so come to Lanikai Beach with everything you will need for the day. Parking is very different from many other beaches on Oahu. Many other popular beaches like Kailua Beach, Hanauma Bay, Waimea Bay, and even some beaches in Honolulu have designated parking areas. Lanikai Beach is tucked inside a residential neighborhood. It feels more like a neighborhood beach than a tourist destination, but because of its beauty and mentions in the media, it’s become a place that many visitors want to go. Because Lanikai Beach is not set up for tourists, you have to park in the neighborhood of Lanikai. Lanikai Loop is the road that runs through Lanikai. There are two one-way roads that loop around Lanikai. The road next to the beach is Mokulua Drive. On the right side of that road is a bike lane where parking is strictly prohibited. On the left side, parking is available. Parking is also available down the side streets of the neighborhood. Avoid parking in front of doors and driveways and to follow all of the parking signs. Be respectful of the fact that you are parking in someone’s neighborhood. And don’t leave valuables in your car. Because parking is so limited, I advise you to get to the beach early in the morning, before 9:00 am. And avoid going on the weekend if you can help it. That’s when all of the locals go and it gets really crowded. 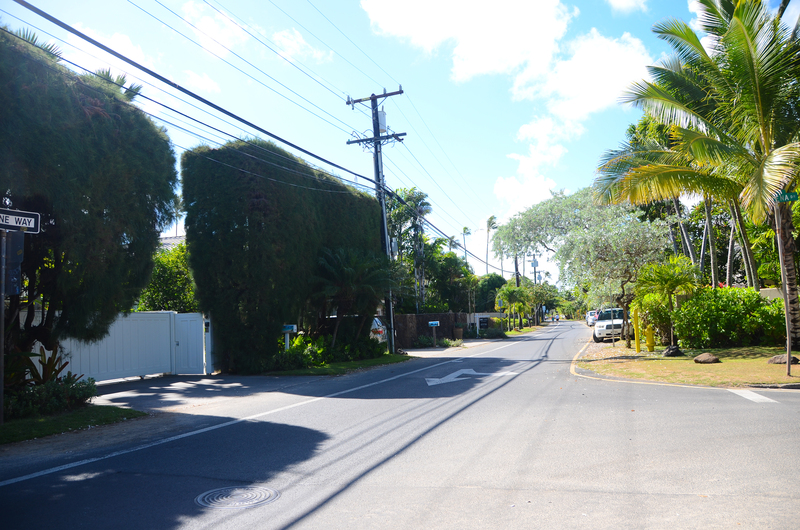 Park along the main road or the side streets in the neighborhood of Lanikai to get to Lanikai Beach. Remember to be respectful of those who live in Lanikai. You will see little beach access points that look like this. There are a few of them along the main road, so you shouldn’t have to drive too far. You can't see Lanikai Beach from the road - it's almost hidden! Look for these access points. There really are no accommodations at Lanikai Beach. The parking is minimal, there are no restrooms, and there are no lifeguards. There is also no wheelchair access and there are a few steps you have to go down to get to the beach. For wheelchair access and a beach with restrooms, go to Kailua Beach down the road. Unlike many other beaches on Oahu that have breezy palm trees, there is no shade at all available on Lanikai Beach. Lanikai Beach is beautiful, but you have to bring your own shade. For an ideal day at Lanikai Beach, here’s the best advice I can give you. Go on a weekday. 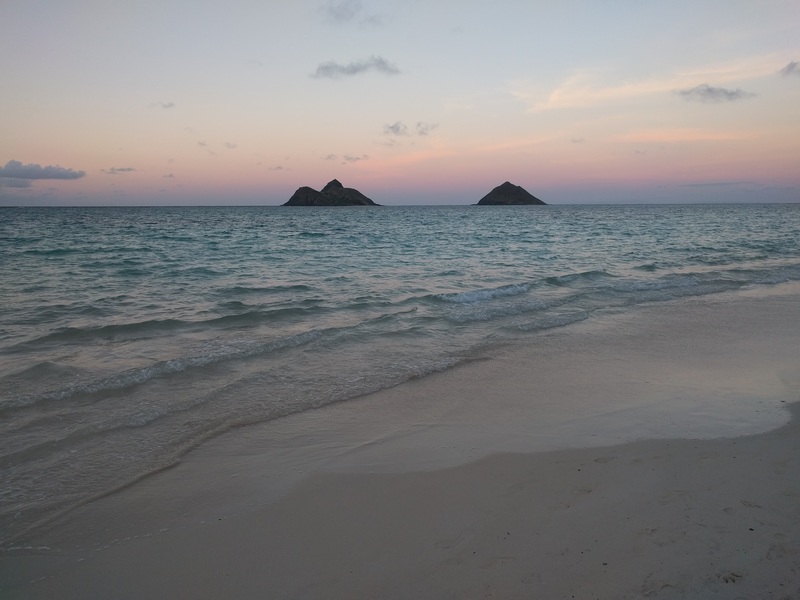 Get up early and get to Lanikai Beach in time to watch the sunrise. This will kill two birds with one stone. You will have an easy time finding a parking spot, and you will get to watch the most beautiful sunrise on the island. Plus, you can spend a few hours at the beach before it gets too crowded and before the sun gets too hot. Since there are also no snack shops here, stop at Kalapawai Market in Kailua on your way. They open at 6:00 am and serve breakfast and lunch all day long. So, you can grab a sandwich and save it for later. They also sell snacks and souvenirs. After you’re done with the beach, you can explore nearby Kailua. Kailua is a beach town with lots of small boutiques and delicious cafes.